FCIT. "Fyodor Dostoyevsky author page." Lit2Go ETC. Web. 26 April 2019. <https://etc.usf.edu/lit2go/authors/166/fyodor-dostoyevsky/>. 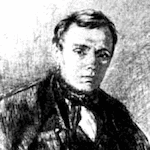 FCIT, "Fyodor Dostoyevsky author page." Accessed April 26, 2019. https://etc.usf.edu/lit2go/authors/166/fyodor-dostoyevsky/.